The Sophie Allport Domed Glass Standard Tea Light Holder has a simple domed shape with an antiqued silver finish. 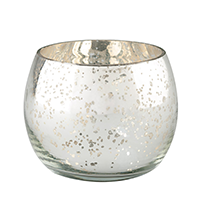 This is a stylish tea light holder that illuminates a warm festive glow not only at Christmas time but all through the winter season. Add some sparkle to your home!